Heroes are not born. They are people who are bestowed the description based on the life they live, and in how they inspire positivity in those who admire and respect them. It is a rare occasion that I am lost for words. As someone who earns a living based on words, it is a difficult thing to admit when speech escapes, or when there is nothing I can say. The photo you see was taken a short time ago. Two tough men striking a tough pose. But even the toughest exteriors can never hide the weakest personal spots. 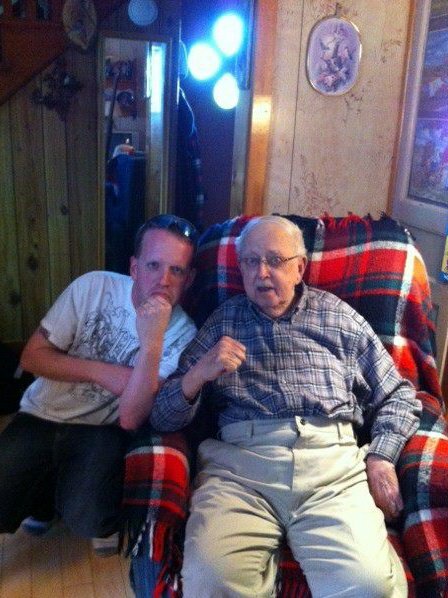 My Grandfather lived an amazing 90 years of life. Many of those 90 years are times most of us only wish we could have lived through. I like to think that my ability to formulate stories, and tell them well, was inherited from him. I felt quite a sense of justifiable pride that he was around long enough to know that I am trying to make a living off of my words. Our last conversation was one I will treasure forever. We were plotting to sell alcoholic beverages from his room at the Northumberland Veterans Unit in Pictou, Nova Scotia. We came up with a reasonable price structure, banners and everything! Knowing full well it would not be permitted. He asked if I would swear on a bible to be a good husband and provider. When I reminded him that I would not swear on a bible, and that I already had the good husband and provider part covered, he cracked up laughing for a brief few seconds. He knew exactly what to say and that we could make something funny from it. The morning of his passing, I received word that my first book, Planned UnParenthood – Creating a Life Without Procreating, was to be approved for international distribution. I am so grateful that he supported my artistic attempts. Part of this was because he wanted to be known as the best singer in the family, and knew I would not take this honour from him. Fact is part of the reason I play bass is because it is my musical voice. I can barely sing! My next book “Crooked Dice” is a collection of absurdity-laced satire, which will be available for release sometime in 2013. It will be dedicated in his honour. For he surely would find much of the stories being told in this collection amusing and entertaining. William (Dann) Alexander is a Freelance Writer based near Halifax, Nova Scotia. His first book Planned UnParenthood – Creating a Life Without Procreating, is available through Lulu.com at http://bit.ly/OamxY6 . The book will be available through several International Book Retailers around December, 2013, and Canadian Online Book Retailers and in E-Book Version sometime in early 2013. Posted in Notes from the Frogpond.Tagged bible, books, funny, Grandfather, hero, heroes, humour, husband, life, living, Nova Scotia, pictou, Planned Parenthood, Planned UnParenthood, satire, speech, Veterans, writing.